Bishop's Post dishes out comfort classics with a little twist at their Chesterfield location. 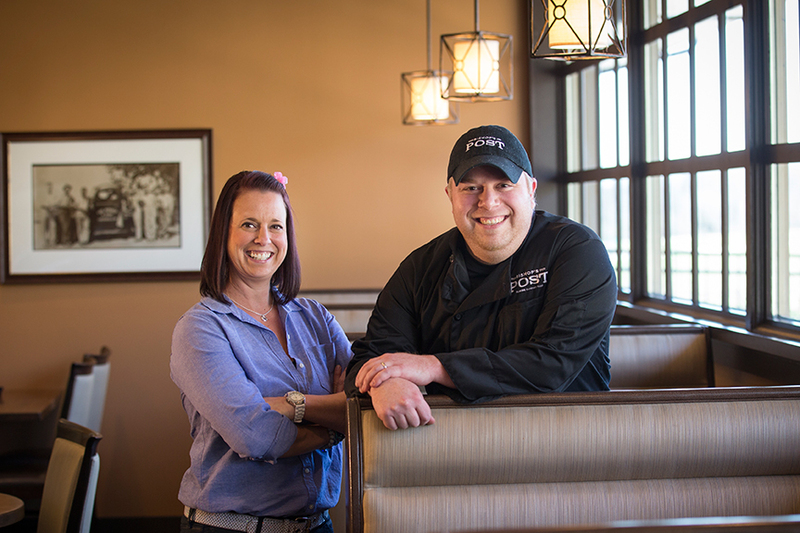 General manager Brenna Marchand and chef Jon Hoffman. You’ll find something for just about everyone at Bishop’s Post. That goes for the menu and the setting, too. “We have the best patio in Chesterfield,” says general manager Brenna Marchand. One side is covered by a roof, and the other abuts a burbling waterfall — a lovely scene that gives little hint that Chesterfield Mall is just up the hill and over the parking lot. The restaurant can seat up to 300 people and offers a variety of large rooms, making it a popular place for parties, business meetings and other groups, she says. Bishop’s Post’s motto is “Classic Comfort Fare.” The menu is divided accordingly, drawing upon influences from around the United States and around the world: Under “Comfort,” you’ll find fried chicken, four-cheese lasagna, a pork rib chop, a 10-ounce hamburger and St. Louis-style spare ribs. 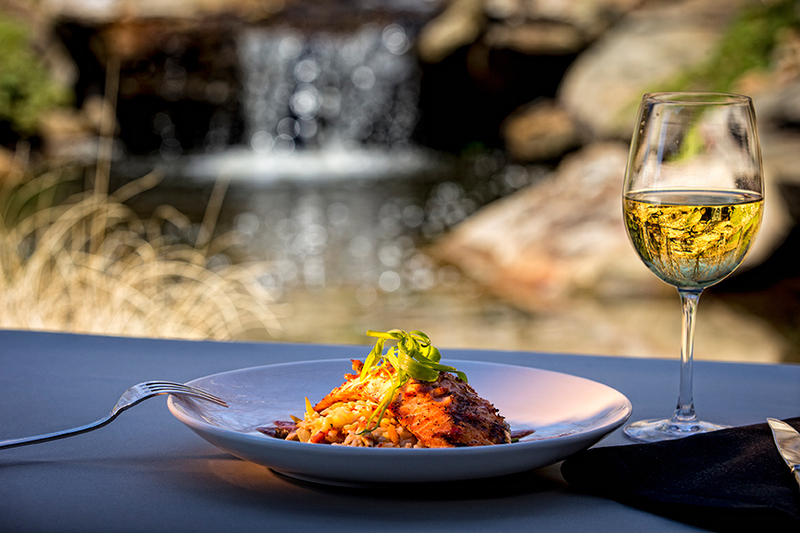 The “Classics” include filet mignon, sea scallops and a St. Louis favorite, spicy voodoo shrimp linguine. “Everything has a little twist,” Marchand says. The meatloaf comes with caramelized onion gravy, chicken breast medallions are topped with roasted red grape port wine reduction, and the macaroni and cheese can be topped three ways: with pan-roasted beef tenderloin, mushrooms, onion and baby spinach; grilled chicken, sautéed onion, jalapeño, tomato and baby spinach; or blackened grilled shrimp, mixed peppers, onion, tomato and corn. Chef Jon Hoffman of Bishop’s Post will demonstrate these dishes at the May Cooking School on Wednesday, May 13, from 6:30-8:30 p.m. at Construction Appliance. Shrimp and Grits: Even eaten alone, these grits would be packed with flavor, thanks to diced bacon, diced jalapeños and cheddar cheese. 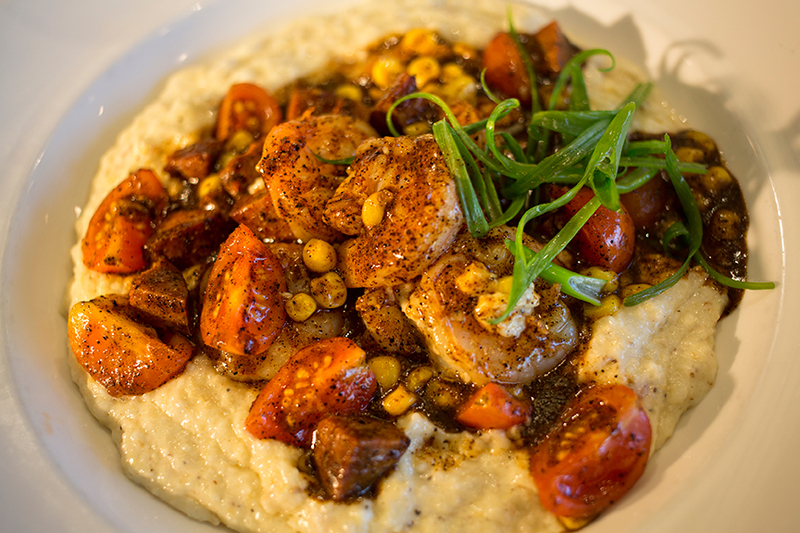 But Hoffman doesn’t stop there; he spoons on seared shrimp, tomatoes, corn, andouille sausage and a sauce made lively with Cajun spices. 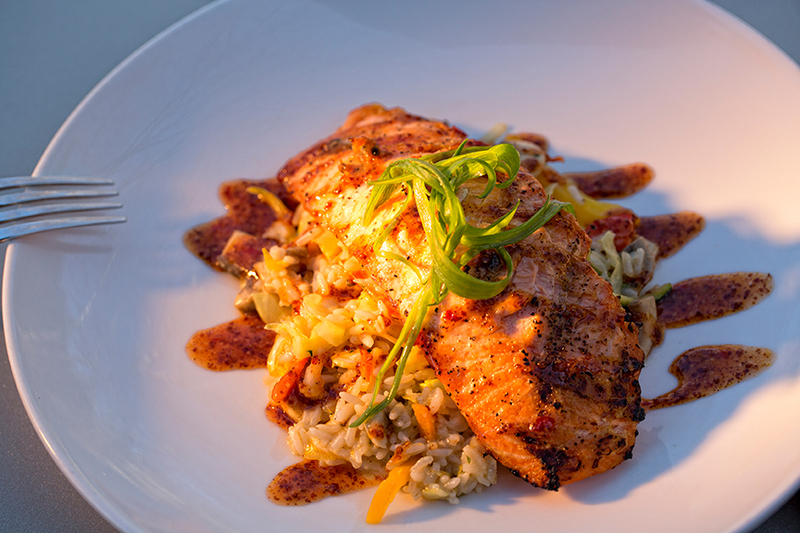 Wild-Caught Salmon: Hoffman cooks skinless salmon on the grill, arranges it over rice pilaf and Asian vegetables, and then drizzles it with sweet chili-mustard glaze. Bishop’s Signature Sirloin: When you’re starting with 10 ounces of dry-aged prime beef, the more simple the preparation, the more you will enjoy the flavor. Hoffman rubs sirloin steak with olive oil, seasons it with salt and pepper, and grills it until done. 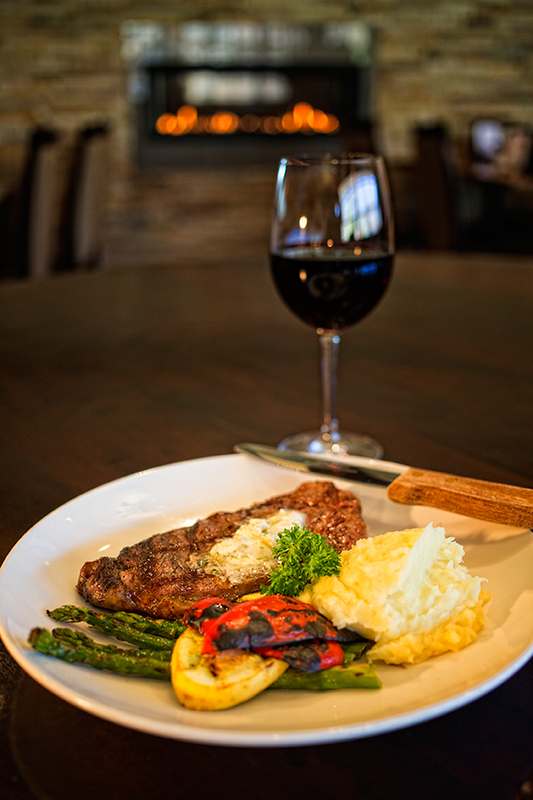 Mashed potatoes and vegetables round out the plate, but the steak itself needs no embellishment.